Can you talk a little about how the idea for Happy Family came to be? I’d been reading a lot of articles about the adoption of baby girls from China, and one parent’s comment in particular stood out for me. They said one of the reasons they adopted from China was that, unlike adopting a child in the U.S., there was no chance of the mother coming back to take the child away. So I got to thinking, What if someone did take away the child? Families are already such complicated things that I could imagine a situation like that being a potential tinderbox. You spent two years teaching in China. How did this experience influence your novel? During my second year in China I was an English teacher at Hwa Nan Women’s College, which is in the city of Fuzhou, Hua’s hometown in the book. This was the first women’s private college in the country, and, in addition to being a great place to teach, it’s located in an interesting part of town. Foreigners were restricted to this area in the 1800s, so if you take a walk around the neighborhood you’ll see remnants of the British Embassy, the American Embassy, and other colonial buildings that have been turned into schools or apartments. Fuzhou is relatively modern but here it’s like you’ve stepped back in time. In the sections about China I really wanted to give a sense of how much change that country is going through. You have young people who have grown up with cell phones and Western movies, and then there are their parents or grandparents who still remember the Cultural Revolution. A city will contain courtyards left over from the Qing Dynasty, concrete Soviet-type blocks, and skyscrapers. As it’s often said, China is really a country that’s looking forward and backward at the same time. You were born in America, but you chose to have your main character be an immigrant. Why? In a way I did feel like an immigrant when I moved to New York. At that point I had been living in China for three years, right after college, so I didn’t know what the real world was like. Hua’s immigrant experience is actually based somewhat on my parents’ when they first came to New York from China. My father worked in a restaurant as a short-order cook when he arrived in America some fifty years ago. My mother came to this country as a student, but I see some of her in Hua too, in her fascination with a new culture. It was important to me to convey some of that personal history because I feel that for those of us whose parents were immigrants, and who seemed to have moved upward socially and economically from the immigrant stereotype, there is a tendency to forget that past. Whereas in reality there are many Asian Americans who still live in poverty or feel alienated from mainstream America. Underneath the surface we’re not that different. What is your opinion of international adoption from China? I have to admit that I have conflicted feelings about the issue. Of course it’s wonderful that these children are going to be loved and have opportunities that they would never have had if they’d stayed in China. Of course they’re better off with parents in America than being in a Chinese orphanage. But at the same time I can’t help feeling sad that they won’t know as much about their culture than if their parents had come from China. It’s already so difficult for second-generation Asian Americans like myself to feel that connection, that I think it would be even harder for them. I think it’s important that their adoptive parents not only try to introduce them to Chinese culture, but also to Asian American culture so that they will feel a part of something when they grow up. And make them aware of the love/hate relationship that China and the U.S. have with each other. Chinese people have a long history of dealing with Western discrimination—not only the Chinese in their native land but certainly also immigrants who came to America. 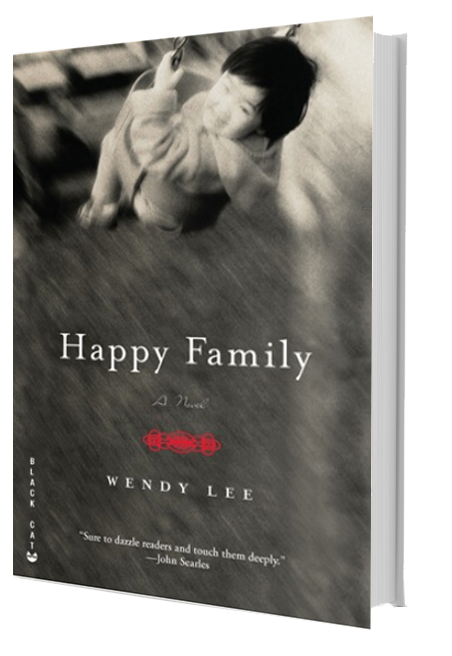 How do you think families with adopted children from China will react to the book? Despite the fact that the premise sounds like an adoptive parent’s worse nightmare, I hope they’ll enjoy it. I hope they’ll be able to identify with both Jane and Richard, the parents in the book, and Hua in her search for a relationship with people who initially appear so different from herself. My intention was not to portray Jane and Richard as bad parents—like the rest of us, they’re tired, overworked, and want the best for their loved ones without compromising what they want for themselves. Ultimately this is a story about the infinite and extraordinary ways strangers can come together, which I think all families can relate to.